I have done it both ways. I have cut an apple and eaten part of it and when I got back to it the exposed flesh had browned and, because it looked unappealing, I discarded a mostly-fresh apple. Alternatively, I have returned to a similar apple and ate through the bad looking browned part to the perfectly good remainder and ate it anyway. Kids don’t even seem to notice that their apple has browned, most of them will eat apples in this condition. 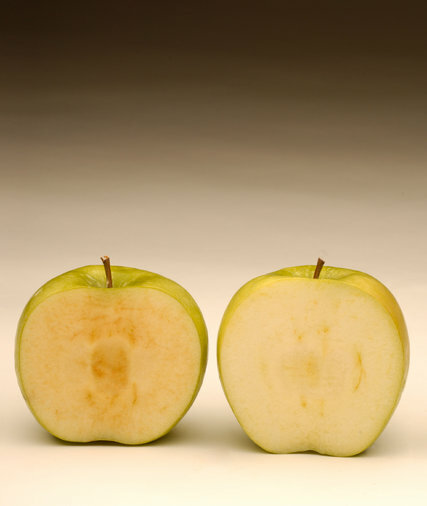 Apparently the problem of apples browning has drawn the attention of the genetic modification sciences, and the perfect apple is coming out of the seed laboratories of Okanagan Specialty Fruits. An apple is now approved for planting in the US that will not brown or bruise. At first the trees will only be in small orchards, 20,000 trees on 20 acres. It will be at least two years before these new trees bear fruit. The Department of Agriculture says that these new species of apples will not be a threat to existing species, they pose no danger to other apples or the environment. I am sure the testing was rigorous. The FDA has no opinion on the topic due to the fact that apples are considered GrAS, meaning generally regarded as safe, requiring no FDA approval. The apple will be named Arctic variety, and the first ones will be like Granny Smith and Golden Delicious apples–no red apples yet. I hate to be a worry-wart and dismiss a great new thing just because it is new. The problem I have with this is that nobody really knows what the apple will miss when it has lost the ability to bruise. It may be that bruising is a side effect of something that the tree really needs, or the bees, or us as consumers of the fruit. Biology is a very complicated science, and even the smartest biology departments in the world can’t answer a simple question like “if you made an apple that wouldn’t bruise, what would be different about that apple?” They are changing the system of the apple tree without knowing what it is they are changing. The resulting changes to the world are also unknown. Apples are joining potatoes in their new-found ability to resist browning when cut. Simplot last year created a potato that doesn’t brown, called the “Innate” potato, that you will find already cut up for you on your produce shelf. I wrote about that innovation in this article here at “One Small Change”. When we create these Frankenfoods, we loose the ability to ship our crops to nations that will not accept GMO foods. Some countries won’t even trust our regular crops if they are grown near GM crops. There are countries in Europe that don’t see the need for the risk. I don’t either. I don’t see how they could be approved for planting or marketing without extensive multiyear testing on the tree and on the environment and on the consumer. Read the rest of the news flash here, in the New York Times. This entry was posted in Health and tagged Arctic Apples, FDA, frankenfoods, genetically modified foods, gmo, GMO crops, USDA. Bookmark the permalink.